As a general rule of thumb, it is not a good sign for the results of a company’s corporate social responsibility program to be featured on The Daily Show with Jon Stewart. The Comedy Central satirical show spent over eight minutes of Thursday’s episodes to pick apart the reaction and planning (or lack thereof) of BP to the Gulf of Mexico oil spill. Just a day later, another company earned an endorsement no company would want: an invitation to court. This one was from the Justice Department for the Massey Energy’s “willful criminal activity” due to the company’s alleged safety lapses that may have been the cause behind the death of 29 miners in April. Of course, these disasters are horrible events that have affected, forever, the lives of the families of those who were lost in both tragedies and lives of flora and fauna that are currently being lost in the waters of the Gulf of Mexico. These accidents teach us the importance of safety standards and emergency planning. But they also teach us the role CEOs and their leadership style play in ensuring that an entire company, made up of thousands of individuals, can understand the connection of issues pertaining to sustainability, the bottom line, the brand promise, and potentially the lives of themselves and the co-workers. As the primary leader of a company, the CEO is also the Chief Sustainability Officer (CSO) and as such is not only responsible for financial returns, but also social and environmental concerns. Most importantly, this is the cast whether or not a company values sustainability as integral to their business operations. 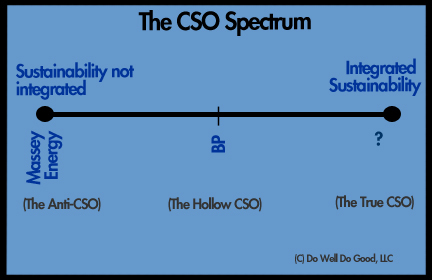 To illustrate this, let’s look at the CEOs of Massey Energy and BP, as representing two of the three models of the CEOs / CSOs play in implementing (or not) corporate sustainability: The Anti-CSO and The Hollow CSO. 2) To create and implement the vision and strategy needed in order to obtain those results. So where does CSR / sustainability fit in? It exists to the extent to which a CEO and a company’s Board of Directors consider positive and negative “externalities” as components of those two responsibilities. The role of a CSO is to ensure that the business practices, plans, and programs reflect the values placed upon these externalities. Inherently, this involves an appreciation on the importance of long-term planning and the execution of that plan. The actions of a CSO, and subsequently the “marching orders” handed to the rest of the company, places the CEO along a spectrum. On one end of the spectrum is the Anti-CSO who opposes the idea that business should consider social and environmental impacts in business. On the other end of the spectrum is the True-CSO, who integrates sustainability throughout all levels of the company and into all aspects of the business. And then you have Tony Hayward, the CEO of BP, who fits squarely in the middle. BP has made significant contributions to sustainability, but has also been met with criticism that shows an inconsistent approach. Through the Gulf of Mexico oil spill, the subsequent finger pointing, and the apparent lack of imagination in emergency planning, Hayward and his company have proven to the public what can happen to your reputation when your actions don’t match your ad campaigns. First, let’s rewind a bit. According to Adweek, between 2004 and 2007, BP has spent over $100 million dollars each year as it tried to change its image to something greener. BP had long been criticized for its campaign. All of that paid-for brand equity went up in smoke through one, major accident. BP has a colorful history in sustainability. On one hand, BP was the first major energy company to publicly state that there is a link between global warming and energy, is the world’s largest producer of solar energy through one of its subsidiaries, and is investing $8 billion in alternative energy R&D. To some extent, BP puts money where its mouth is. Yet that same mouth apparently forgets to talk to the rest of the company. The company has also received the largest fine in the history of the Occupational Health & Safety Administration: $87 million for the 2005 explosion outside of Galveston, TX which killed 15 workers. In mid-2006, a BP pipeline burst in Alaska resulting in a 200,000 gallon spill which covered at least two acres of tundra. BP pleaded guilty in 2007 for a violation of the Clean Water Act which ultimately cost the company $20 million. These are just a few examples of BP’s sullied history. The sad part: it didn’t have to be this way. Had Hayward, who took the helm in 2007 from an equally touting and hollow CEO/CSO John Browne, ensured that sustainability was truly integrated “as part of the DNA of the company,” someone in the company should have thought about conducting what-if scenarios and disaster contingency plans. Knowing that it’s inevitable for accidents to happen in the extraction industry, it really wouldn’t have taken much imagination to think of a situation where a massive fire turns out of control. Emergency preparedness, especially when you’re in a dangerous industry, is an absolutely critical component of sustainability. Since those what-if scenarios were never done and especially since it took so long for BP to identify a way to stop the leak, the hollow reputation BP tried to build over the years cracked and sunk along with the rig. It will be hard for BP to resurrect that fragile reputation, although my money is on that they are going to try. You said it – money will be spent. Maybe now BP can actually get a bonafide reputation for moving their money more aggresively into alternative energy; I don’t think a hollow CSO is part of that playbook, though.